How would you like to design your Business Cards? Shininess so thick, you can feel it. This tactile finish brings even the unprinted parts of your design to life. Get the perfect fit for your brand. Check out our easy-to-customise design templates. Just add your logo, images and text, and you're ready to roll. Select your product, get your price. 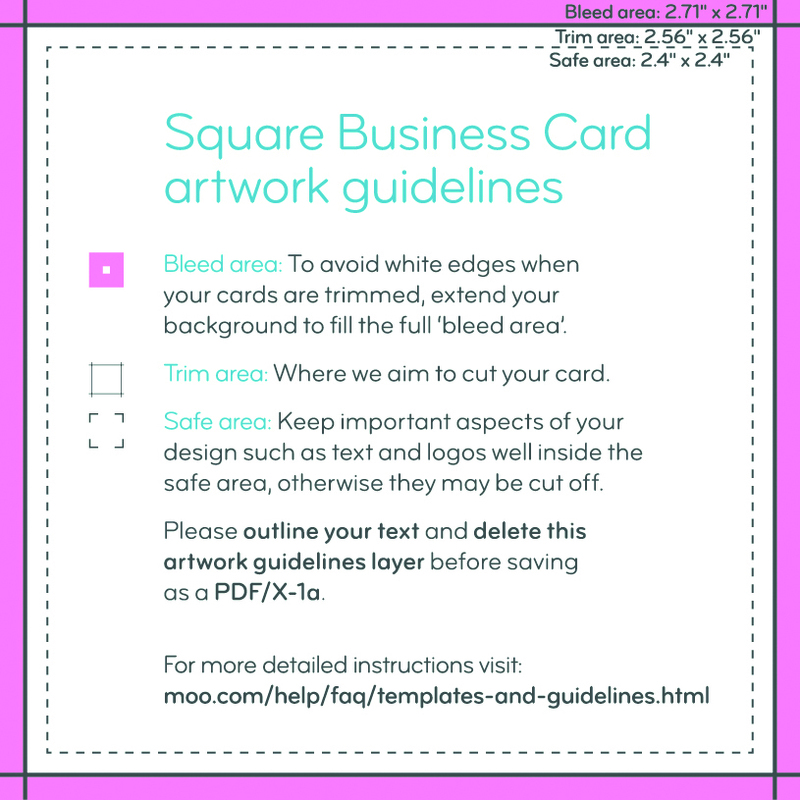 Bleed Area: 3.66" x 2.16"
Make sure that your background extends to fill the bleed to avoid your Business Cards having white edges when trimmed. Safe Area: 3.34" x 1.84"
Create Two files. One for the artwork, one for the Elements. The artwork file will house the main design image. CMYK color file in PDF, PNG, JPG, or GIF format. The element file will define where the element is applied on top of your design. B&W PDF file only. Bleed Area: 2.71" x 2.71"
Safe Area: 2.4" x 2.4"
"Raised Spot Gloss draws attention to my wordmark. I’ve had clients who don’t need a card, but take one anyway"
Let’s raise a gloss (see what we did there?) to the MOO community getting seriously creative with their cards! Head to the blog for sweet designs, inspiring stories, and business tips. Want to add a sprinkle of "wow" to your branding? Check out how these creatives turned heads with our irresistably tactile Raised Spot Gloss. We met with interior design company UTH Studio to talk branding, handling competiton, and keeping that small business feeling as you grow. You're your own boss – hooray! Keep yourself happy, engaged and passionate about your work with some simple strategies. Extra-thick Mohawk Superfine paper. Naturally textured (and great to write on). In your choice of eight color seams. How soon can I get my Raised Spot Gloss Business Cards delivered? In as few as 5 business days. What sizes of Business Cards do you offer with Raised Spot Gloss? We offer Raised Spot Gloss on our Standard, MOO Size and Square Business Cards. Why use MOO's Raised Spot Gloss Business Card printing service? Raised Spot Gloss adds a shiny, memorable accent to your Business Cards. And with our satisfaction guaranteed promise, you can't go wrong.